A summary of the work over 2014 to 2018, as initially interpreted by Steve Young, CLASP’s Archaeological Director. Good news about a home for CLASP! A message from Dave Hayward, Chair of CLASP Trustees. It may be that our long search for a permanent home and archive is over. Thanks to some excellent support by one of our members we have been introduced to the manager at New Creation Farm at Nether Heyford, he has offered us the chance to rent a building at the farm for use as our home. The building which is of substantial wooden construction has ample space for our archived materials together the ability to accommodate an office/classroom and finds-processing area. It is exactly what we need to satisfy our requirements. The Trustees have visited the building and agreed in principle to accept the offer on the basis of an initial three year lease, with an opt out clause for us after a year if it is not financially viable. The agreement will entail building repairs remaining the responsibility of the owners whilst CLASP looks after alterations etc. We will have to fit the building out with shelving, furniture etc. This will, of course, entail significant fund raising for CLASP – any suggestions, help or even donations will be welcome! The CLASP Trustees will take a final, formal decision at the next Committee meeting on the 4th February 2019. More details after that date. Last year CLASP had a Stand at the Milton Keynes History Event. If there is sufficient support we are going to repeat this on 15 and 16 June in Campbell Park in Central Milton Keynes. We will repeat last year’s format with visitors to our stand being invited to design mosaics that will be photographed and posted on our website. Each person who does this will be given a certificate recording their participation. The centre of the stand will have display material about CLASP and its work. On the other side CLASP member and author of the Ruso (Medicus) historical novels, Ruth Downie, will be on hand in period costume. , member of the Organising Committee and Trustee. I am looking for help and possibly guidance from any member who has knowledge and experience of ‘Safeguarding and protecting people’ (Young persons and vulnerable adults). Your Trustees need to consider this subject as a matter of urgency to formulate a policy for CLASP. Just a few words to wish you all a successful 2019, and to thank you all for the efforts that you have made to help CLASP sustain its ongoing technical successes. I cannot however stress enough the importance for you all to remain involved if this situation is to be sustained. Hopefully, perhaps our long held vision to establish a permanent base will move forward in 2019. If this does come to fruition there will undoubtedly be a ‘call to arms’ for help in getting the project operational. 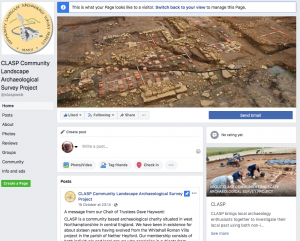 It is also important that we appreciate the support and co-operation we enjoy from those outside of CLASP in the worlds of commercial archaeology, academia and others who provide material and financial support. These relationships are essential to enhance our technical knowledge and ensure a mutual exchange of information between this wider archaeological world and ourselves. To that effect can I suggest that members look to attend relevant courses and conferences to broaden your knowledge and understanding of relevant matters; these events enable you to create important contacts in the world of archaeology. Some of you may know that we now have our own Facebook Group (click on the link above). If you are active in social media could I please ask that you get involved with our Group to make it a success. Both through this, and any other method, I ask you all to spread the word about CLASP and seek to widen our membership base. We hope to see and hear from you all at our activities during 2019! Free guided tours of the site will be available every 30 minutes from 10am – 12noon and 1pm until 2.30pm. Visitors should wear stout shoes – boots and warm clothing on site. Today we have switched our Facebook presence from a “Page” to a “Group”. Groups are much easier to manage and use than Pages. The “old” Page is still there, but will be deleted before very long: it is not now possible for anyone other than the administrators to post to it. The new group is “public”, which means that anyone at all can view the posts, comments, description and list of members. But only group members can post and comment. Anyone can ask to become a group member – you DON’T have to be a CLASP member. Join CLASP (only £10 a year) and get involved. We are keen to see it succeed but to do this it must have participation from CLASP members and others. You do not have to be a Facebook member yourself to either look at it or ‘post’ onto it. Secretaries/ representatives from CLASP member societies are asked to pass this message to their respective memberships if they have not already done so. It is important for this initiative to succeed. Please support it and raise the CLASP profile on a wide front. Really worth a look at as they provide good, basic, information on a myriad of archaeological/ historical topics, should be compulsory reading for all!